We make Christmas cookies, a variety of Christmas Stollen (a true European Christmas Bread), Gingerbread Men, Fruit & Nut Bread and also some traditional European Treats. We also make a Gluten Free Christmas Cookie assortment and a Wheat Free Gingerbread Assortment in the Circle of Life Bakery. On September 27, 1989, Grainharvest Breadhouse opened its doors – and the community has benefitted ever since from the quality artisanal breads they bake on a daily basis. Over time, owners Hubert Wurm, Roland Berchtold and David Nötzold added new stores and even supplied bread for the Toronto 2015 Pan Am Games. Looking back, however, one of the things they’re most proud of took place in June 2013. That’s when the owners decided to give back to the community that had made them so successful. 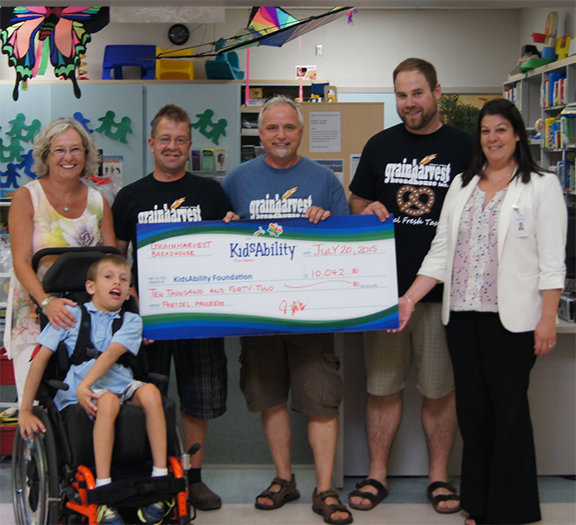 As the needs of the community continue to grow, KidsAbility is thankful for organizations like Grainharvest Breadhouse. After all, simply by selling pretzels, they’ve made a huge difference in the lives of children and youth with special needs. Photo Below: (Left to right): Michael (KidsAbility client sitting in the wheelchair), Linda Kenny (CEO, KidsAbility), Hubert Wurm, Roland Berchtold, David Nötzold and Charmaine Brown (Senior Development Officer, KidsAbility Foundation). KidsAbility Centre for Child Development is the recognized leader in Waterloo Region and Wellington County for empowering children and youth with a wide range of complex special needs. 3) Physical disabilities such as cerebral palsy, spina bifida and muscular dystrophy. KidsAbility Foundation inspires and engages community partners, individuals and groups to help make a difference in children’s lives. Through the annual Kids Can’t Wait campaign donations raised through our generous community help to bridge the ever widening gap between what the provincial government provides and what is actually needed to provide the care to our clients. Without this generous support, more children would be waiting even longer to receive the care that they deserve and so desperately need. Presently, there are approximately 570 individual children waiting for services at KidsAbility. Grainharvest Breadhouse was vote by the Waterloo Chronical Readers’ Choice Awards, Best Bakery in Town for the third consecutive year. Thank you to all who voted for us, we are happy to be your favorite bakery in this awesome community! Our Waterloo store got bigger; we added a Gluten Free section with over 250 products in addition to our existing line of Gluten Free baked goods, called “Circle of Life”. The new Gluten Free products we added range from: Cereals, Oatmeal’s, Pastas, Rice, Meal helpers, Cooking sauces, Crackers, Baking mixes, Flours, Sweet & Savory Snacks, Frozen Items: Pizzas, Buns, Bagels, Waffles, Donuts and much more. We invite you to come and see for yourself. We started this with the help and expertise of Grandmas Gluten Free Goods; they operated a Gluten Free grocery store in town for years. Grandmas also made a few delicious baked treats, which we will implement over the next couple weeks. Christkindl Market at Kitchener City Hall, Thursday - Sunday, December 4 -7, 2014. Be sure to visit our stand filled with traditional European Christmas treats and much more, Gluten free products are also available. We make Christmas cookies, a variety of Christmas Stollen (a true European Christmas Bread), Fruit and Nut Bread, Gingerbread Men and also some traditional European Treats. We are the home of the Official Kitchener-Waterloo Oktoberfest Pretzel. Taste the difference, they are freshly baked everyday right here in Waterloo. We have been supplying the Festhalls and Community Events attached to the KW- Oktoberfest with Pretzels, Applestrudel, Buns & Bread for the last 20 years. Time spent sharing a tasty meal is one of the simple joys in life. While planning appealing and nutritious meals for 365 days of the year can be a challenge, one easy way to keep meals interesting is to simply change ingredients to alter the overall experience. Any sandwich can go from basic to sublime by exploring the wide variety of artisan breads and rolls available from artisan bakeries such as Grainharvest Breadhouse in Waterloo. For instance, consider your basic grilled cheese sandwich – cheese toasted between two slices of bread. It’s satisfying and filling, but can get boring after a while. Now kick up things up a notch - use slices of Asiago Cracked Pepper bread to make your humble grilled cheese and it becomes an exotic flavour adventure! Gluten free breads from the Circle of Life line of baked goods can be enjoyed by those with or without dietary restrictions. Culinary adventures using artisan baked goods is not limited to sandwiches! Mouth-watering burgers hot off the barbeque are a whole new taste sensation when served on hearty Pretzel Buns. Moist, tasty chunks of the circular Jalapeno Garlic bread can be scooped out to become a serving bowl for delicious dips using the pieces of bread and crispy farm-fresh vegetables for dipping. Any meal can have a special touch when accompanied by a bread basket filled with warm garlic bread or a variety of organic buns. Wheat free and gluten free pie shells available from the Circle of Life line of baked goods allow many diners requiring specialty diets to enjoy fresh-baked desserts tailor made to their needs. Vanilla ice cream between two Sesame Crunch cookies makes for a tasty treat. Visit the Grainharvest Breadhouse locations in Waterloo, Kitchener and the St. Jacobs’ Farmers Market for your freshly baked artisan buns, bread and sweet treats. Meal planning will never be boring! Call 519-725-1920 or follow Grainharvest Breadhouse on Facebook orTwitter to find out more about new products and specials. At local artisan bakeries, such as Grainharvest Breadhouse in Waterloo, a dedicated group of bakers go to work mixing, kneading and baking fresh handcrafted baked goods ready for you and your family to enjoy. There is nothing quite like a loaf of bread or a moist pretzel, warm right from the oven. When enjoying locally made baked goods, have you ever thought about where the ingredients that go into those delicious foods come from? By definition, artisan baking means using traditional methods and as much as possible uses locally available ingredients. Southern Ontario offers a bounty of produce for fresh and good tasting baked goods. When you are enjoying these delicious items, you are not only supporting your local artisan baker, you are supporting a myriad of other local farmers and suppliers as well! Preserving Ontario’s bee population is vital not just for the supply of local honey, but for maintaining the pollination of just about every crop grown! The exclusive use of local honey as ingredients in artisan baked goods ensures that local bee farmers continue to have the support of their community. And eating local products means that you know where your food comes from and how it was produced - maple syrup, eggs, organic rye and spelt flours, cheeses from local cheese makers, and much more. Over 900 kilograms of apples from Martin’s Fresh Fruit Farm in Waterloo, Ontario was used in one weekend to bake mouth-watering apple strudels at Grainharvest Breadhouse! And there’s more to come. Grainharvest Breadhouse supports the Kitchener Waterloo community beyond baked goods. In addition to donations of baked goods for community fundraising events, 10 cents from the sale of every fresh soft pretzel sold goes to KidsAbility, a local not-for-profit organization for children. Visit Grainharvest Breadhouse to find out more about the delicious artisan baked goods you can enjoy! Drop into one of the Grainharvest Breadhouse locations in Waterloo, Kitchener or St. Jacobs Market to pick up your favourites. Call 519-725-1920 or follow Grainharvest Breadhouse on Facebook or Twitter to find out more about new products and specials. Get the latest updates about deals and news!